Grocery is a linchpin of a $175 million investment by Walmart to upgrade its Canadian store network for a better omnichannel experience. Walmart Canada said Thursday that it plans to refurbish or update 23 stores by February to create a “seamless intersection” of in-store and online shopping. As part of that effort, the retailer has opened a new supercenter in Burnaby, British Columbia, that features a large selection of East Asian food. It also recently converted three stores in Newfoundland to supercenters, making that format and its fresh grocery offering available in every province. 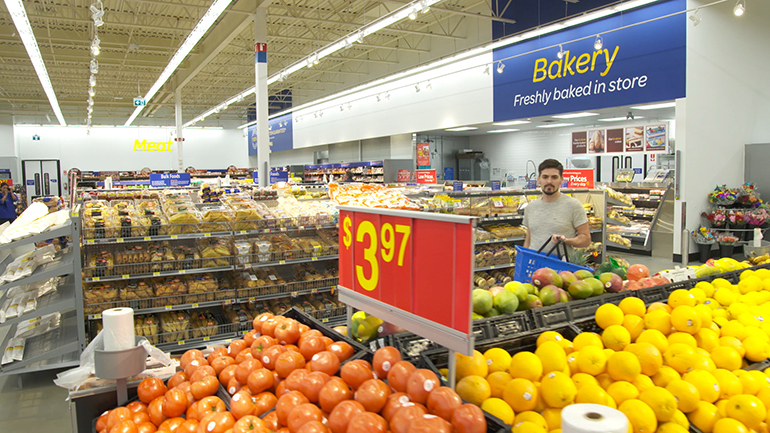 Physical updates bring a new look and feel to the stores, including wider aisles, a refreshed color palette, new signage and, at some locations, a revamped storefront design to provide clearer access, Walmart Canada said. To optimize the omnichannel experience, the stores will feature dedicated parking spaces for online grocery pickup and new interior areas that facilitate the interaction of e-commerce and brick-and-mortar operations to process online orders faster. Customers also will find an expanded product assortment, including new ethnic and organic items, which will “further integrate stores into the community,” according to the company. "This investment in our stores is part of our commitment to provide our customers with an improved in-store shopping experience. We are modernizing our stores, ensuring a seamless omnichannel shopping experience and meeting evolving customer needs," Walmart Canada President and CEO Lee Tappenden said in a statement. "As we move into 2019, we'll continue to invest in more store remodels, including new and creative concepts in key urban stores,” he added. The stores being updated include 11 locations in Ontario, four in Alberta, three in Newfoundland, two in British Columbia, two in Quebec and one in Manitoba. The new retail store investment builds on other initiatives under way, Walmart Canada said. For example, the company plans to roll out Walmart Grocery Pickup to 73 more stores in 2018, which will lift the number of click-and-collect stores to 165 by the end of the year. Last month, Walmart Canada kicked off pilots of same-day grocery delivery at 12 stores in the Toronto area and five stores in Winnipeg under a new partnership with Instacart. The companies said Instacart delivery will be introduced at Walmart Canada stores in more markets based on customer engagement and use of the platform. Also in September, Walmart Canada launched a sustainable online grocery delivery service in metropolitan Vancouver through Food-X Urban Delivery Inc., which is part of Sustainable Produce Urban Delivery Inc. (SPUD), one of Canada’s largest online grocery companies. Other efforts by Walmart Canada include the construction of a $175 million fulfillment center in Surrey, B.C., and plans to transition 100% of its fleet to alternative power by 2028. "Walmart Canada is committed to helping Canadians shop when they want, how they want and where they want," Tappenden commented. Overall, Walmart Canada operates 411 stores and serves more than 1.2 million customers daily. The Walmart.ca online store is visited by more than 750,00 customers per day.